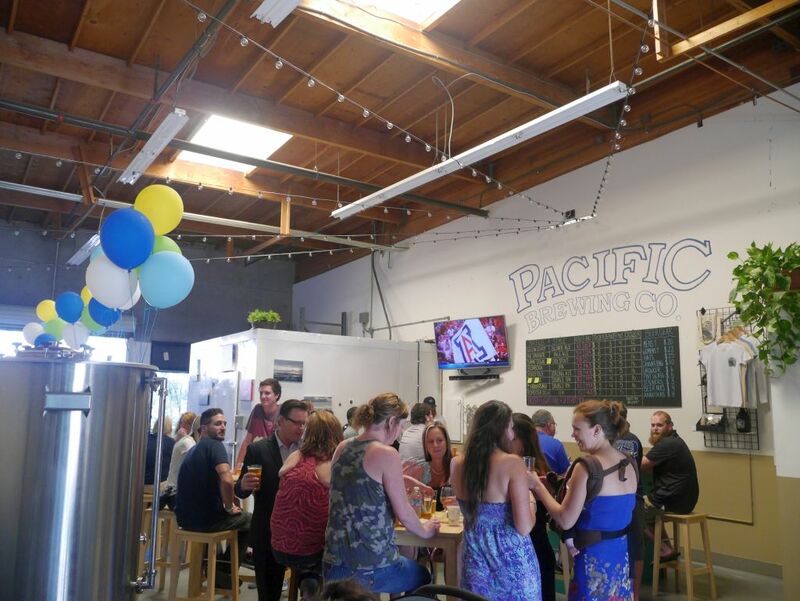 A year ago I was at Pacific Brewing Company when they had their grand opening party. Now they are still around and pouring their core beers. 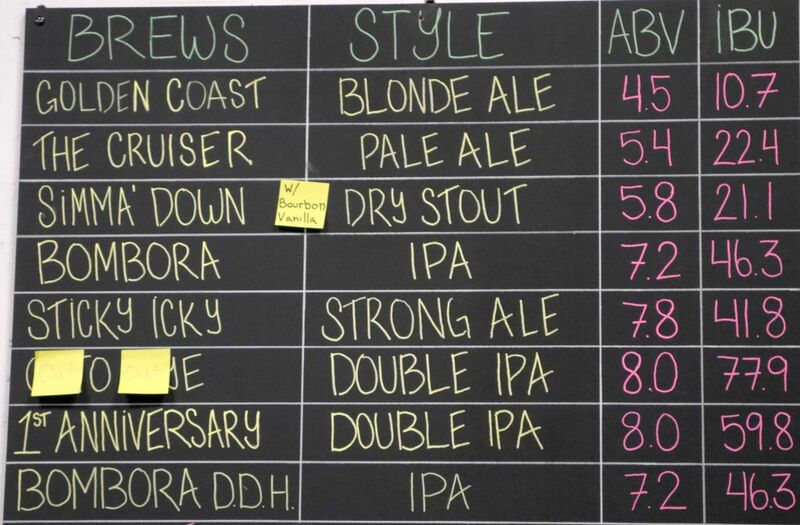 For the anniversary party they put on an anniversary double IPA, a barrel aged version of their stout, and a double dry hopped version of the Bombora IPA. Unlike other anniversary parties around they didn’t have a price at the door so you could come by and have a few tasters or a pint without any of the other stuff if you want. I had a taster flight that included the barrel aged stout, anniversary double IPA, double dry hopped Bombora IPA and the Sticky Icky. To me the barrel aged stout was a bit more heavy on the vanilla and didn’t have much of the bourbon flavors I was expecting. They seem to have decided to showcase the flavors of the base beer. I could have done with more bourbon flavors because the vanilla gave it a little syrupy sweet flavor that didn’t work for me. Then came the anniversary double IPA, a nice lightly herbal beer with a solid bitter bite and mild amount of sticky sweetness. This was great and would go nicely as a pint. Then I had the double dry hopped Bombora, a sticky dank citrus beer with plenty of extra kick thanks to the extra hops. It stood up to the anniversary even though I had it after the anniversary double. I ended with the Sticky Icky to see how it held up since the opening. It seemed a little less sweet than I remember it being but it was a bit more balanced, which gave it a very pleasant taste. The beer had a nice light roasty flavor and mild hop bite, making it a proper stronger amber without going overboard like many try to do. 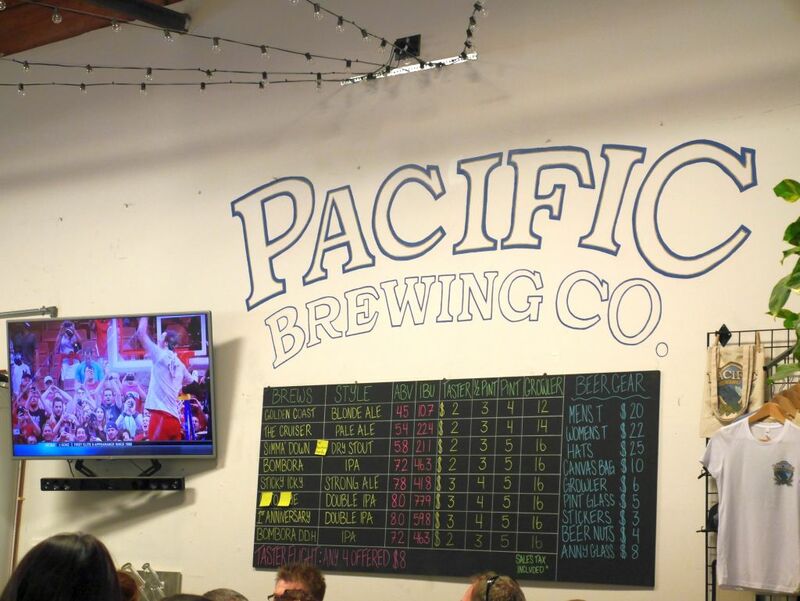 It was good to see Pacific sticking to their core beers they started with. Since opening they added the televisions so they have some of the games on as well. I’m glad they managed to keep similar hop flavors going in their anniversary beer despite the difficulty of getting many of the hops they likely used to start with. 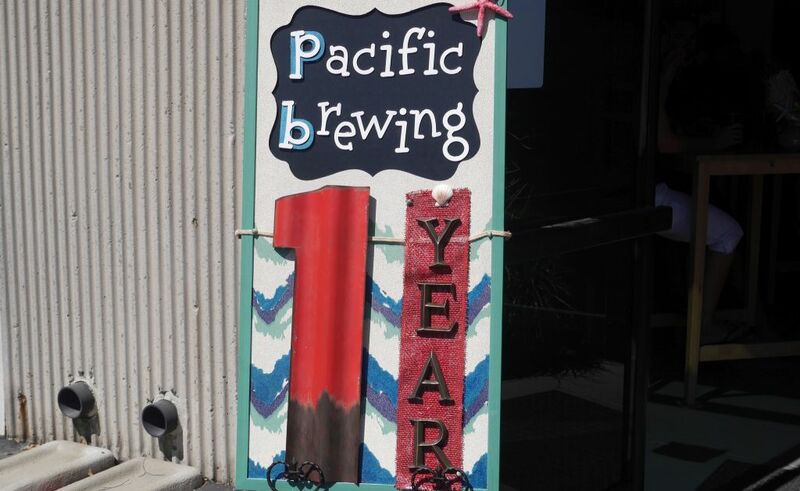 I look forward to what Pacific will come up with over the next year. 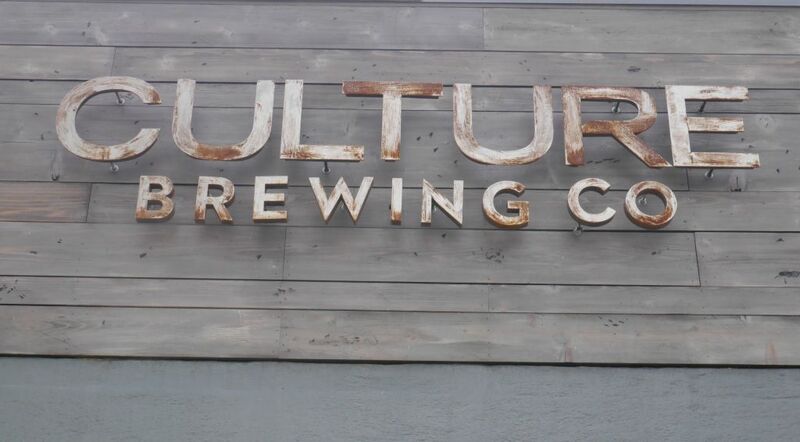 Council Brewing started out strong when they opened last year, delivering a wide variety of beers to appeal to all sorts of craft beer drinkers. 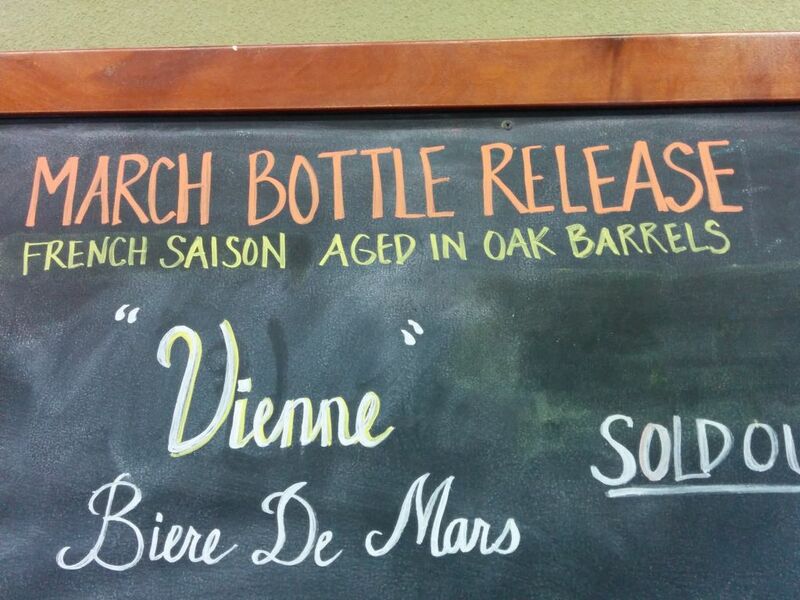 Since then they have done a few limited releases of beers in bottles starting with a sour saison then a barrel aged tripel then a bourbon barrel aged imperial stout then their tart saisons and finally yesterday they released Vienne, their first barrel aged french saison. While I haven’t yet opened my barrel aged pirates breakfast imperial stout the barrel aged tripel they released last year was quite delicious. In the San Diego area the french farmhouse ale known as Biere de Garde is not widely produced. Lost Abbey bottles one that is available around town fairly regularly if you know where to look. Other versions are so limited that I did not know they existed. Stone brewed one sometime last year though I never heard about it. 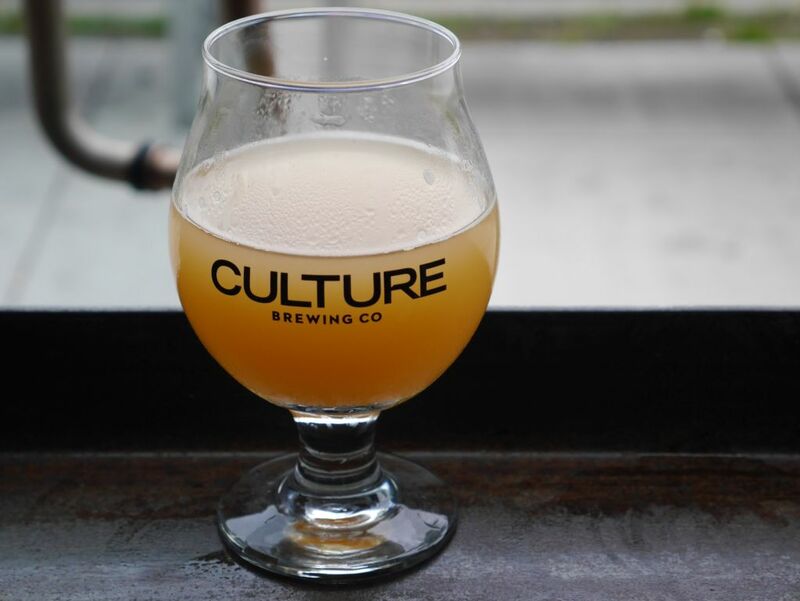 Council’s release of their own Biere de Garde is part of the brewer’s participation in the trend of local breweries exploring styles that are only known to a smaller group of enthusiasts. I had not been aware of the Biere de Garde style until I read “The Brewmaster’s Table” earlier this year that describes the style under the section for French beers. 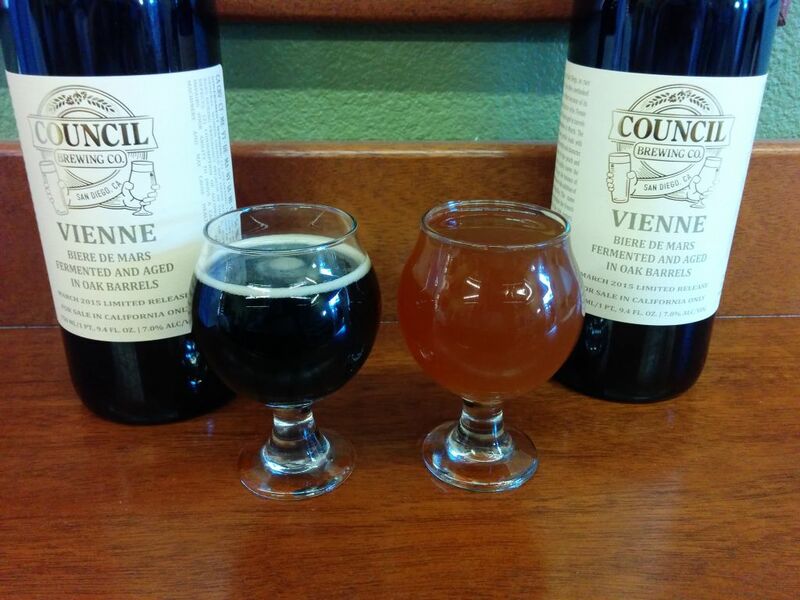 I stopped by the brewery yesterday to pick up my two bottles of Vienne. While I was there, I had a taster of this new brew and also tasted their Irish Stout that was put on a few weeks ago for St. Patrick’s Day. Sadly, the bottles of Vienne sold out so quickly that your only chance of tasting this beer will be to visit the brewery over the next day or two and hope that they still have it on tap, or to find someone willing to part with their bottle. The quick sale of this beer shows just how much demand there is in the local market for beers in this style. Bottles of Vienne with the Irish Stout and Vienne in tasters. Taste wise, I really enjoyed Vienne. The beer was lightly tart, showcasing some nice peach and stone fruit flavors. At other times it displayed a sweet caramel flavor that balanced the tartness nicely. The flavors were smoothed out by the oak quite well. I am looking forward to tasting this beer again when I open my bottles in a few months. The Irish Stout was also impressive, giving a good amount of roasty flavor for the low alcohol content. This is a nice alternative to the stronger Pirate’s Breakfast double oatmeal stout. 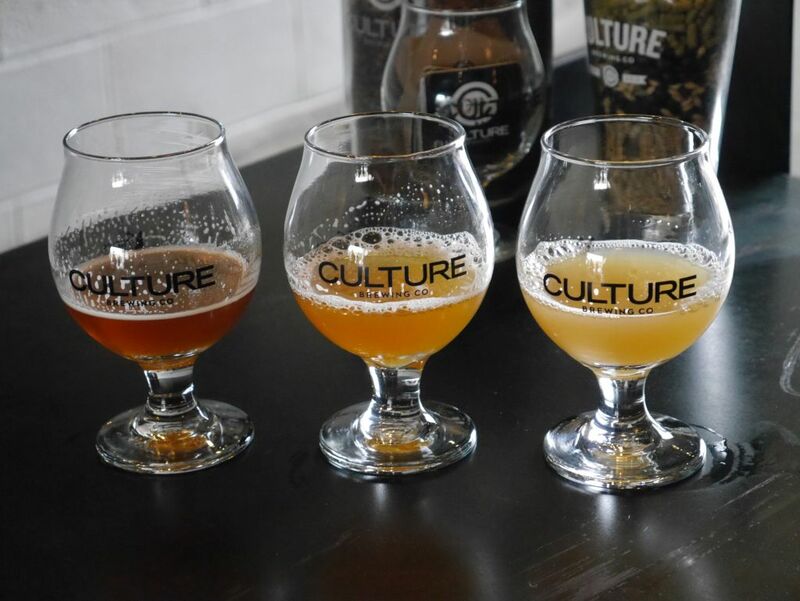 If you are a fan of Council’s tart saisons, now called Beatitude, keep an eye out for future small releases of the beers in bottles at the tasting room. Also keep an eye out on the brewery’s facebook page for announcements of future small batch bottle releases because the next one may end up selling out just as quickly as Vienne. 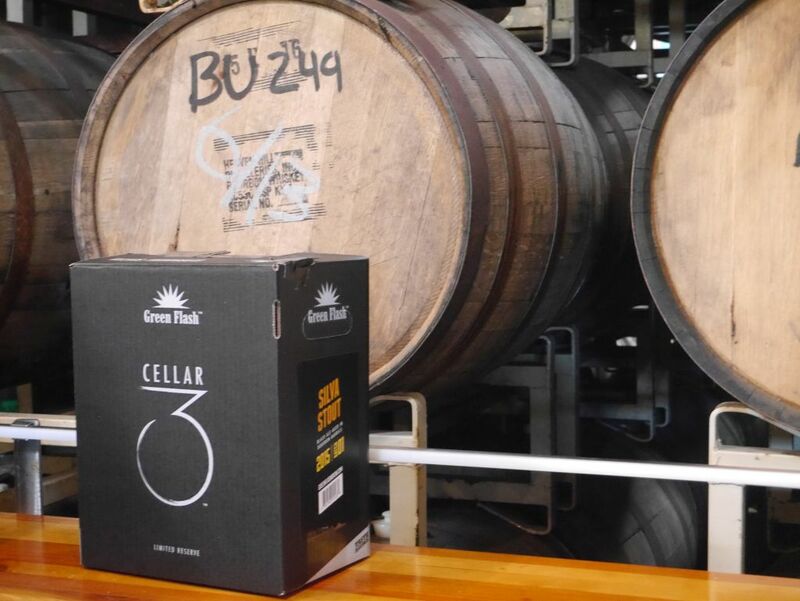 Green Flash had a special release party to promote the first of many barrel aged beers they are aging at their new facility out in Poway they call Cellar 3. 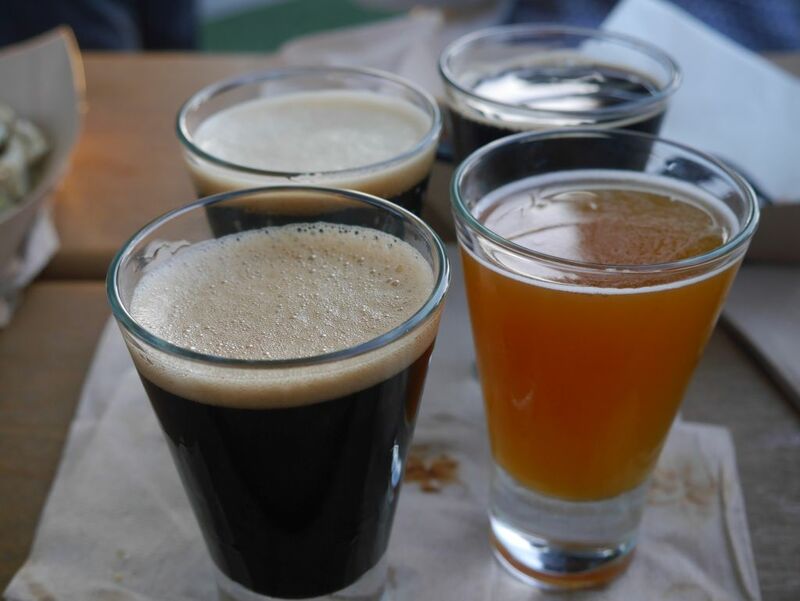 Though they weren’t able to hold this event in Poway, they had a big bash and brought out a number of specialty beers for the occasion. Among the special versions was a special coffee version of the stout that somehow was stronger than the original version, clocking in at a gigantic 13%. Also for sale at the tasting room were bottles of the barrel aged stout. Silva Stout is a blend of bourbon barrel aged double stout and the regular double stout. The coffee version was so strong that I could feel it seriously after only a small 4oz taster. Flavor wise it was not particularly boozy and had a good smooth caramel flavor along with a nutty coffee taste. 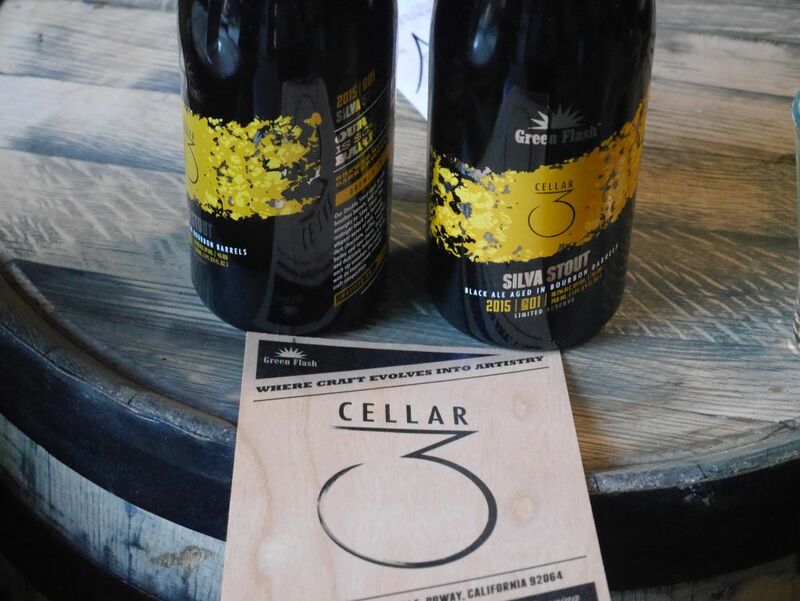 According to the flavor notes they handed out with bottles of Silva Stout the grand opening of their Cellar 3 will be held on May 16, 2015. I look forward to visiting that facility to taste the different beers they have but for now some of the special beers they brought out for the party should hang around for a little bit. 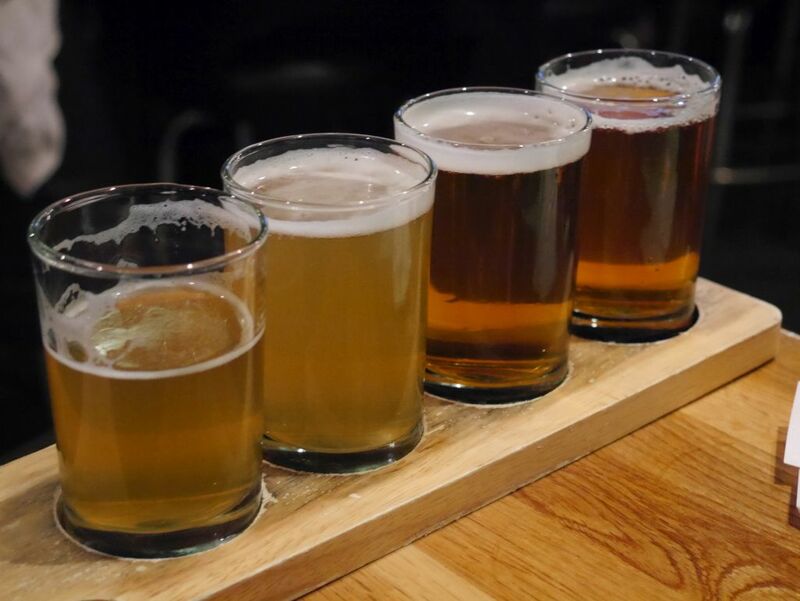 First set of tasters, Left to right, Brett Saison, Le Freak Barrique, Boysenberry Saison, Candella Barley Wine. 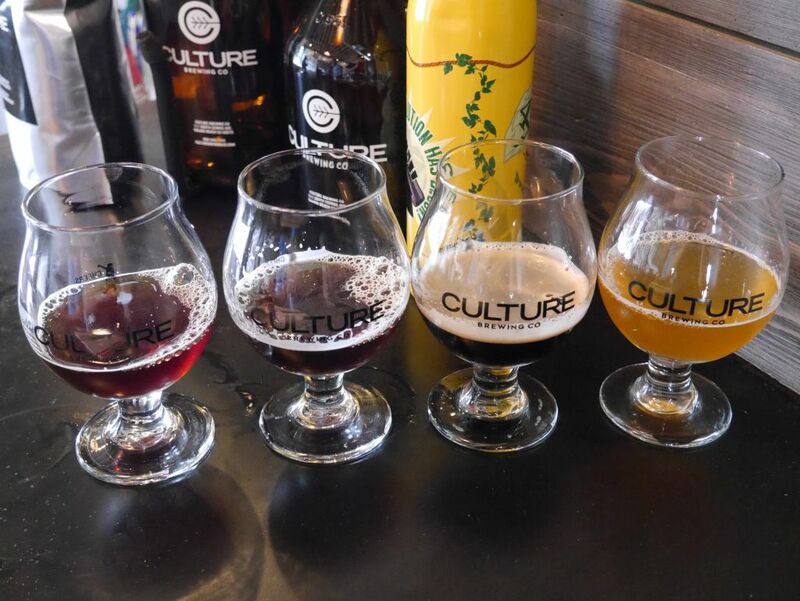 Among them they had some barrel aged Saisons with Brett, a delicious barleywine in collaboration with Cigar City, two varieties of Silva Stout on tap including one extra strong version with Mostra Coffee, a barrel aged Le Freak with Brett and an Apricot version of the same with Brett. Second set of tasters, Cask Silva Stout front left, Black Tiger, back left, Coffee Silva Stout right back, Apricot Le Freak front right. Of these the standouts to me were the Candella Barleywine, Le Freak Barrique, and Apricot Le Freak Barrique. The new recipe of Le Freak works great with the barrel aging and addition of Brett. The Silva Stout was also quite delicious with plenty of smooth chocolate and bourbon flavors. I also came home with two bottles of Silva Stout. 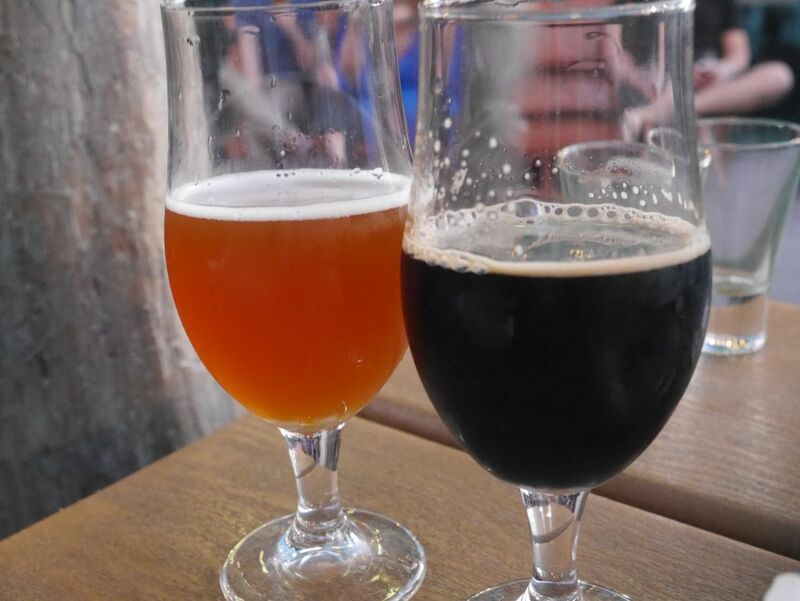 Mango Inferno (left) and Silva Stout (right). I was glad to see that the bottles of Silva Stout were still available three hours after opening and there will also be quite a few that were sent out to distributors you might find in stores. 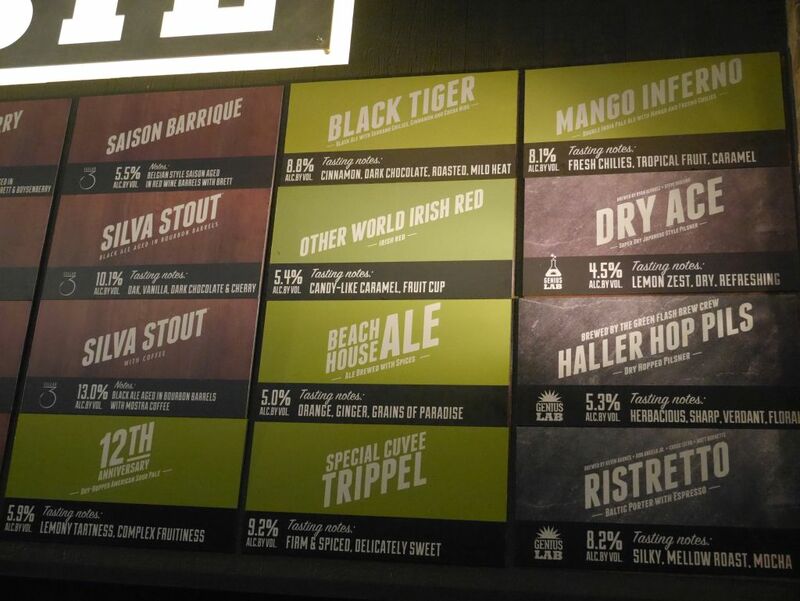 The opening of Cellar 3 should mean more availability of Silva Stout and hopefully some of these delicious Brett Le Freak varieties as well going forward. If you want to try some of these beers you should stop by the tasting room over the next few days so that you can taste some before they go. 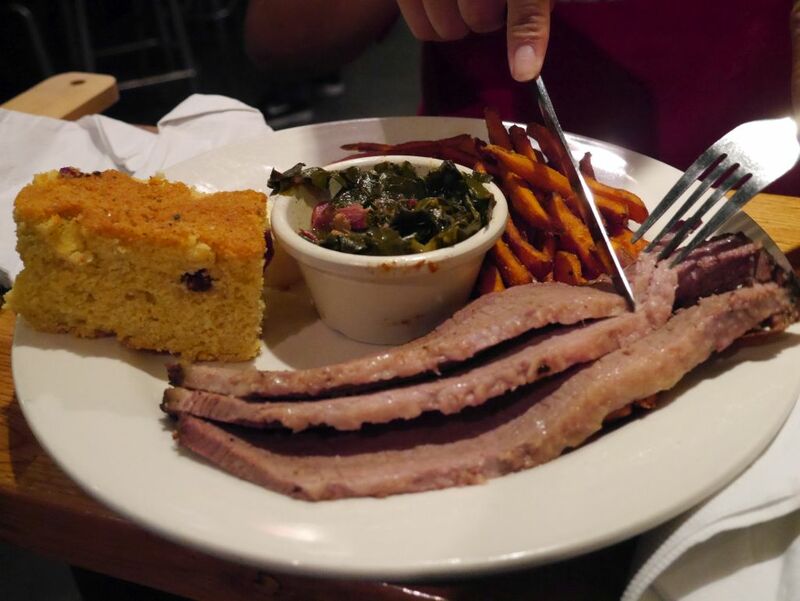 I visited Beachwood bbq for the first time on Sunday March 1st after driving 30 minutes north of John Wayne Airport where I landed coming back from a trip. I had heard such good things both about the food and the beers that I had to make the trip. What I found was some very tasty food and a great selection of house beers that were quite flavorful. 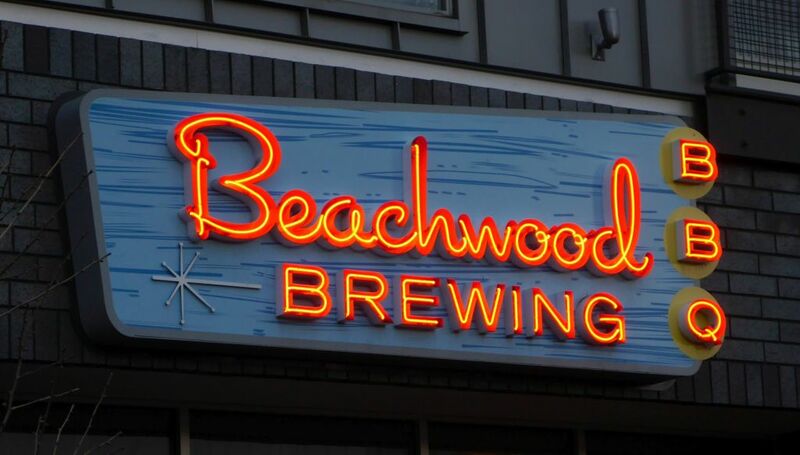 There are actually two locations, one in Long Beach and one in Seal Beach. 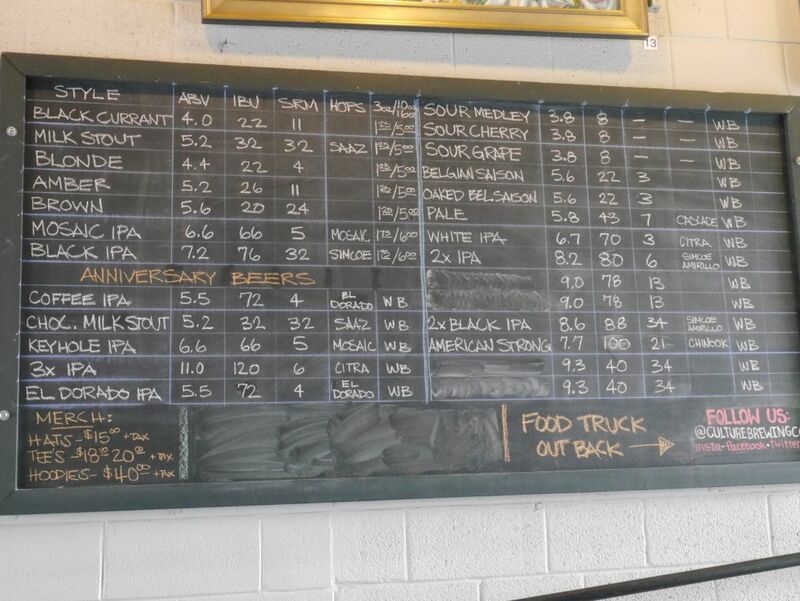 I’m told that the Long Beach location is easier to park and that the Seal Beach location has better guest taps. I tasted a lot of IPAs there because they have a good reputation for getting the flavors right. 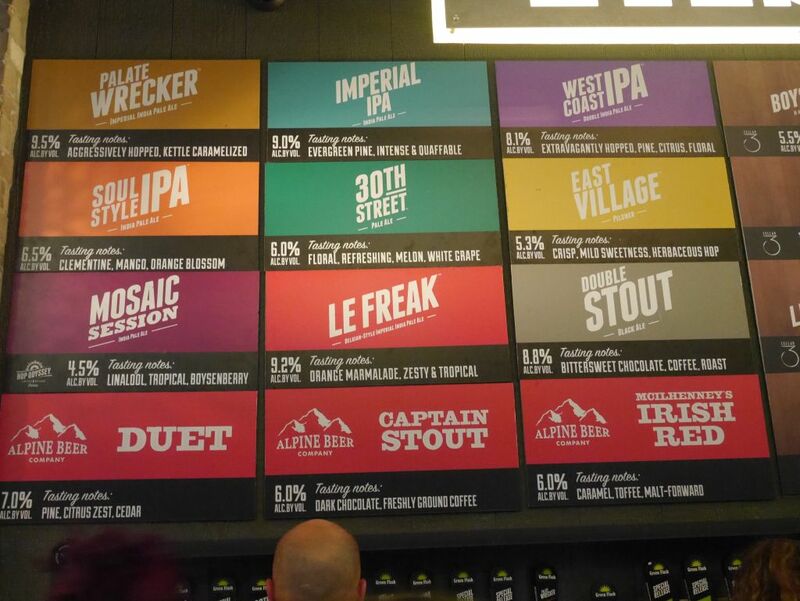 I also tasted a few saisons and a really delicious stout. From what I have been told very few of these beers are regularly available because they like to experiment with new things regularly. However, with such good beers in the range I tasted that day I have no doubt that future beers will be delicious as well. My first flight of the day. 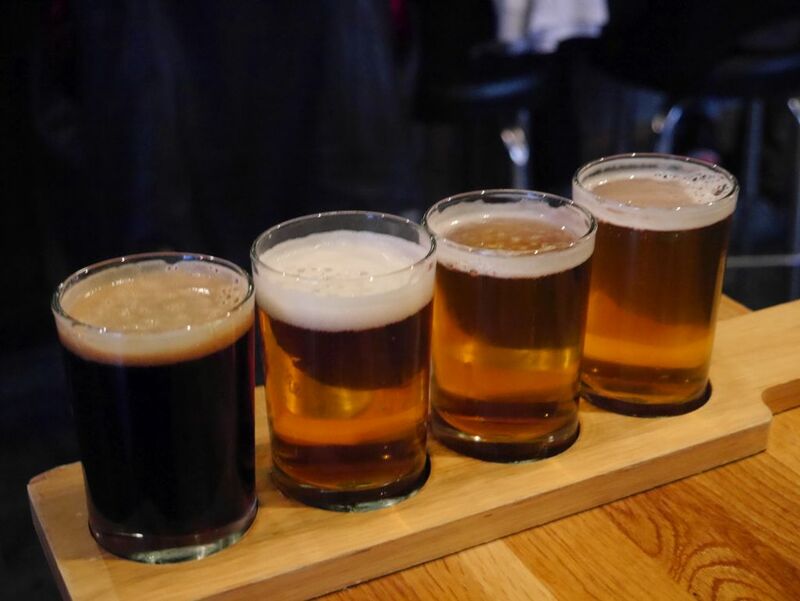 My first flight started with the Alpha Bomb pale ale, the Thrill Seeker IPA, the FV8 IPA and the American stout. 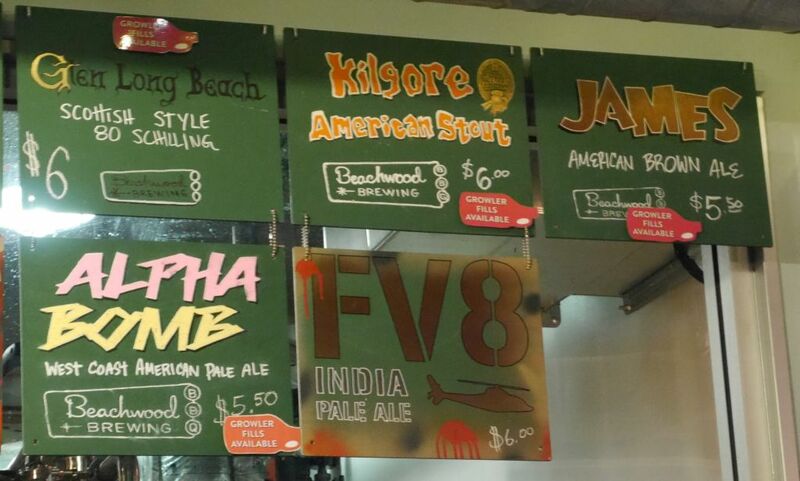 The alpha bomb pale was very tasty showcasing the typical West Coast style flavors perfectly. The beer had lots of citrus and kept the malt lower than the typical pale. Then I moved on to the thrill seeker that was a very enjoyable IPA showcasing some really bright mandarin orange flavor. I might have ordered a pint if I wasn’t tasting so many beers. Next came the FV8 IPA. Though this one was tasty, the floral hops just couldn’t stand up to the previous delicious citrus beers. Still it was very smooth and well made. According to the description these beers starting with FV are the first batch to come out of various fermentation tanks. This one being the first brew out of tank number 8. To end the flight I had the American stout. It was good and smoky with a nice thick body showcasing plenty of good caramel and toffee flavors. My husband was with me and ordered a pint of this stout. Stouts and porters are all he likes. My second flight of the day. 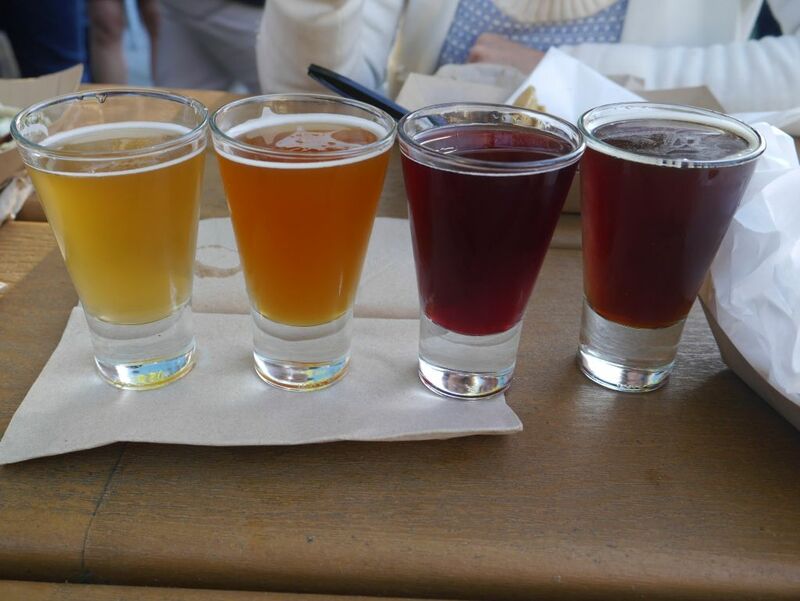 Two saisons are the lighter colored beers. For the second flight I added a few saisons and went for the stronger IPAs. I tasted the Rose Royce saison, Un Atout saison, Ultra Hop 2000, and Hop Ninja. The Rose Royce saison was a flavorful saison with good amount of pepper and spice sticking to the traditional flavors. In comparison the Un Atout saison had much more citrus. I enjoyed the departure from the traditional style here because the citrus went nicely with the beer. The Ultra hop 2000 was a perfectly balanced and delicious west coast style ipa with plenty of grapefruit and citrus. It had a solid amount of bitterness as well. This one as well I would have ordered a pint if I wasn’t doing so many tasters. I really savored every sip of this taster. In comparison the Hop Ninja was a bit disappointing. Without the sweetness I wouldn’t know it was stronger than ultra hop. While not as bitter it had many flavors reminiscent of the Enjoy By IPA from stone but didn’t quite make it. I would almost suggest placing this one before the hop 2000 on the flight. I was also not a fan of the malts used and thought the hops didn’t balance out the malts enough. Overall, this is a brewery that hop heads in the area should absolutely visit. 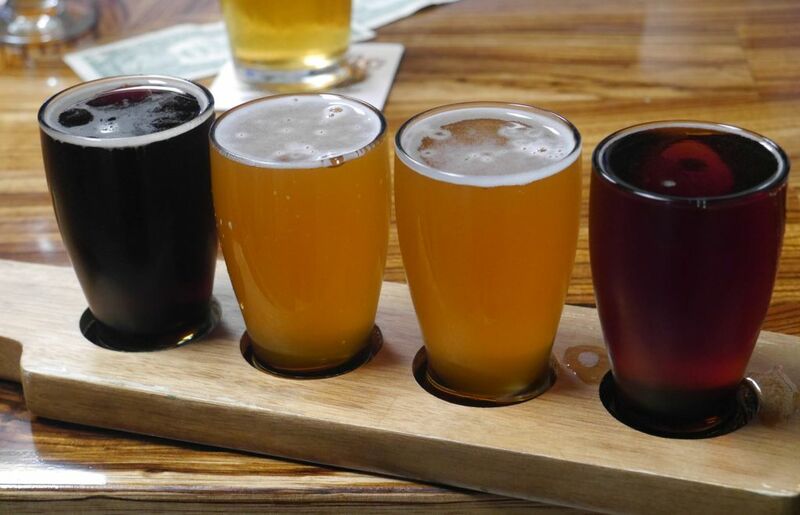 Besides their stellar collection of house beers, they have plenty of guest beers as well. 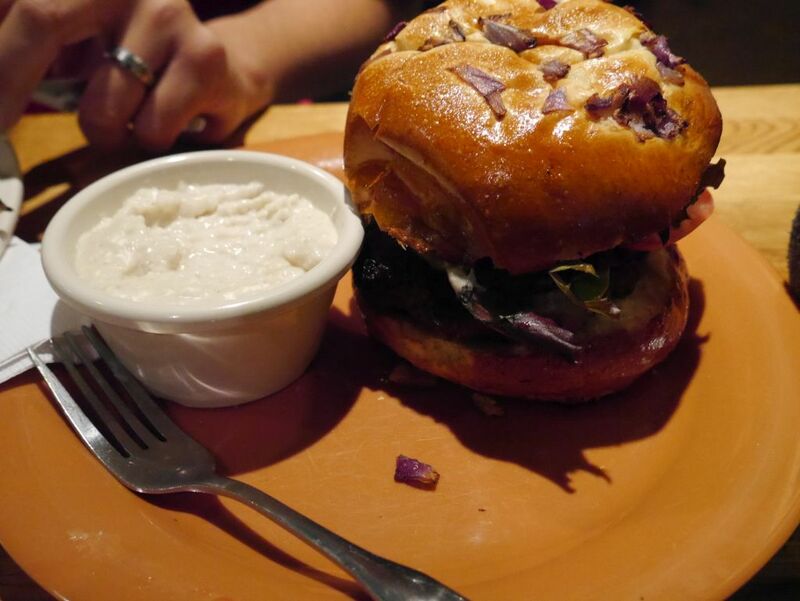 Food wise, I was very impressed by the smokehouse burger, though at half a pound you should split it with someone else. My husband really enjoyed his kale side and the sweet potato fries. The brisket was OK but I have had better elsewhere including San Diego bbq joints.